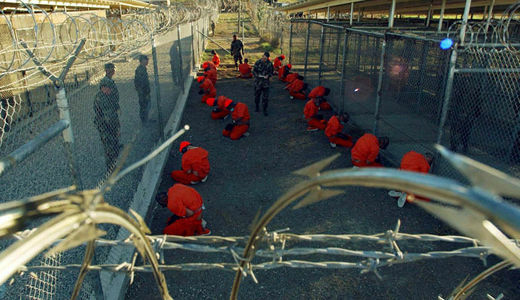 WASHINGTON – In an open letter to President Obama this Friday, human rights organizations have called for his intervention in the ongoing hunger strike at Guantanamo Bay. The hunger strike is a “foreseeable consequence” of the situation in the prison in Cuba whereby “for eleven years, prisoners have been held without indictment,” declared the organizations, among them Amnesty International and Human Rights Watch. The human rights organizations have staged protests in Washington, New York, San Francisco, Los Angeles, and Chicago in support of the dozens of prisoners on hunger strike. The hunger strike among the 166 Guantanamo inmates is now in its third month. The Pentagon asserts that there are 43 strikers, while human rights organizations maintain that over half of the inmates are taking part. Eleven inmates are currently being force-fed. The clash took place in Camp 6, a mostly communal section of the prison outfitted by the military to comply with international standards for prisoners-of-war camps. The prison in Cuba has existed since 2002. President Obama promised to close the Guantanamo Bay prison during his 2008 campaign. Congress, however, blocked the funding needed to close the prison and prohibited the transfer of the inmates to U.S. prisons. The human rights organizations are now calling for the U.S. to release the remaining prisoners to their home countries or to third party nations if they are not being prosecuted. A total of 779 prisoners have been at Guantanamo Bay. Nine have died there.